The Saskatraz queen breeding project from Saskatchewan Canada has produced queens that are proving to be resistant to Tracheal mites and have good results with Varroa. Here is an article about this line of queens, or you can Google the Saskatraz project for more information. We will be carrying some of these queens later this spring. Thinking of a bear fence? This is a recommended bear fence from the MN DNR. The pricing is all wrong but the design is sound. You want an energizer that is 12 volt and puts out at least 2 joules of power. I own a fencer from Premier1. They do not make my style anymore. I put the fencer and battery inside a beehive and mounted a solar panel to the telescoping cover. You will need their wiring harness and a deep cycle battery. One of their solar panels can be added to charge the battery. The folks at premier1 are very helpful. Do not buy the netting. Weeds can grow into the netting and the netting tears easily. With the fencer, solar panel and battery you can have a $400.00 investment. $269.00 puts out 3 joules. I own one of these. This can mount on a t-post. But you need to buy a bracket to mount it on the post. This is a beekeeping class for someone wanting basic information about beekeeping. This is a beekeeping class for the curious! Come find out why there’s so much buzz about bees and determine if beekeeping at home or at Tamarack might be in your future. While not a comprehensive class for new beekeepers, this class will definitely get new beekeepers headed in the right direction. We’ll discuss basic bee biology and ecology, beekeeping tools and equipment, the costs associated with beekeeping and bee resources available in the Twin Cities. Plus, honey tasting will be part of our sweet afternoon snack! There is a Beginning Beekeeping in River Falls, Wisconsin. Class being offered all day on Jan 28 through the River Falls Community Education program. Presented by longtime beekeeper Jerome Rodewald and Dr. Brad Mogen. Cost is $75 plus materials. There are 20 seats available as of today. We will be open 9-3 on Saturday. 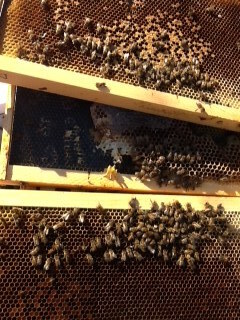 With the warm weather, beekeepers are out looking at their colonies. So you find a dead colony, what do you do? If the colony died of mites or a virus from the mites, the bees are dead and so are the mites. Take the hive apart down to the bottom board. Have a cardboard box with you. Brush any dead bees and debris into the box with a bee brush. Lightly brush off any bees off the frames. Don't dump the bees in the beeyard. The dead bees contain nitrogen and are very good fertilizer. The dead bees will spur grass to grow in the beeyard and you will be mowing the grass more. If there are dead bees in the cells do not try to remove them. If there is dead brood in the frames, do not try to remove them. Close up the hive, cork all holes and close off all entrances. Make them bee tight. The hive will be safe to use for bees again. Re-use all the frames and honey. Olivarez Honey Bees is our bee supplier. They do a great job at their bees. We are proud to sell their quality bees and queens.. Things are happening in the hive and signs of spring are in the works. Our days are getting longer. Sunset now is at 5pm. Great Horned Owls are nesting. I heard black capped Chickadees doing their fee-bee sound. This starts usually in late January. Listen for it. Especially with the upcoming warm weather. Things are changing in the hive right now. The upcoming January thaw will give colonies the opportunity to reorganize in the hive. This is the time of year when bees transition from their lower box moving into the upper box. The warmer weather makes this easier for the bees to accomplish. Some colonies have already moved up if their winter stores are lacking. If a colony is very heavy with honey, the bees may not move up for several weeks yet. But for most of us, the move will be happening from now into early February. There should not be any brood in the colony right now. Normally the queen starts laying in early to mid February. The upcoming warm weather should not spur brood production at the moment. If this warm weather stays around for a while, the queen may start laying early. This can be a problem if this happens, Starvation can occur if near zero weather hits for several nights in a row in February. But for now, enjoy the warm weather, the bees will be out on cleansing flights during this time. If you don't have a top entrance (1 inch hole) in your top box, go out and drill one. The bees need a top entrance now. Check out your bees to make sure they are alive. The warm weather is a perfect time to add winter sugar patties. This emergency food can possibly prevent starvation during any cold spell. You would hate to lose the bees now. Spring is coming, get that equipment painted up. The bee season is starting soon. I am getting my five frame nuc boxes ready for packages arriving in April. I start the packages in five frame nuc boxes and move the bees into 10 frame equipment in late April. We have emailed out information about package bees to everyone on our newsletter list this morning. If you did not get it, the email may be in your junk folder. You can also get it off our website. If you want, you can call the order to us. The sales tax I have on the form, is not accurate, under the 2 lb credit card. Do not email me your credit card number, call the number to me instead. The order form can be mailed to us, we have a secure Post Office box. If the form is emailed to us, leave off the credit card number. You can mail us a check or call us with the credit card number. If the order is emailed, I always respond back to the email. If there is no response from me, means I did not get the email. Technology can fail so we want to make sure that the order was received. We have updated our 2017 pricing on our website. We will be sending out our newsletter Sunday with the 2017 order form attached or you can get it off our website. Happy New Year, I always like to try to sum up the previous year to reflect on how the season progressed. The good and the bad. January was pretty much a normal month. Warm to start out then a couple weeks of very cold weather with warmer temps to finish the month. Maybe a little warmer than average. February was cold from the 8th to the 15th. This did cause some colony losses to some beekeepers. There was brood in the colonies and starvation occurred when bees could not reach honey due to tight clusters because of the cold. Beekeepers using winter patties did fare better. The winter patties provided emergency food during this cold snap until the weather warmed up. February is also the time when beekeepers find dead colonies of bees usually killed by viruses brought on by mites. I myself lost several very nicely populated colonies to viruses. March bought normal to above normal temperatures. Overwintered colonies had great weather to increase their populations. Pollen patties and feed help bolster the overwintered colonies. April started cool but warmed rapidly with above normal temperatures. Packages arrived and the weather was good for installing and for the bees to get a good start. Overwintered colonies continued to build with colony strength looking very good. Divides started a little early with the warm weather bringing up populations a little sooner. May, the above normal temperature brought the spring bloom in faster than normal. We were about two weeks ahead of schedule. The fruit bloom started in early May. Many areas had a freeze in mid May severely damaging the fruit blossoms around MN and WI. Packages were building nicely and overwintered colonies were starting to swarm in late May. The Black Locust bloom was early. Beekeepers that have a large amount of Black Locust trees were able to get several supers of honey by the early June. June the temperatures were at or slightly warmer than normal. The main nectar flow started two weeks early, Overwintered colonies put up honey, package bees and nucs still were not up to good populations yet. When the packages and nucs were ready for honey collection in late June the nectar flow was pretty much over. Swarming occurred from lack of a nectar flow in some areas and that followed us through the summer. July and August were pretty much average temperature wise. There was no Basswood honey around the state. This hurt many new beekeepers preventing them from getting any excess honey this year. Many large commercial beekeepers depend on Basswood honey to get a good crop of honey and they were were hurt with the Basswood flow no show. Some beekeepers did get decent crops off of hay fields and ditchweed flowers. There was never any hot weather this summer. Good nectar flows need heat to produce good honey crops, the heat was lacking this year. Over wintered colonies that were not being monitored for mites, started crashing during this time. Splits that were done off of untreated overwintered colonies were showing stress from high mite counts. These failing colonies contributed to passing mites to other beekeepers colonies. Even package bees that initially had very low mite counts, saw suddenly very high mite counts do to this passing on of Varroa from some unwary beekeepers. Mite treatments were put on in August with good success. Some beekeepers that had a high mite count in August, even though they treated, their bees were so damaged they ended up not making it to late fall. September and October, were warm months. Mite treatments were going on. The early mite treatments kept the mite numbers down. As beekeepers treated in late September and early October in many cases the mites had reached too high of a level. So their survival over the winter is not assured. October was very warm making Oxalic Acid treatments difficult. Many colonies had brood late into the season producing more mites and eating stores. Some beekeepers were feeding late into October which made brood and mite population increase in the colony. This also made Oxalic Acid not very effective on these colonies. November came warmer than normal with many beekeepers not being able to do Oxalic Acid treatments until mid November. Normally we would like to have this done by the third week of October. Time will tell if this helped colonies treated later than we wanted to. Winter came on like a flip of a switch. Cooler weather and snow finally came in late November and December. My summery, while we have no control over the weather, we do have control of our mite population. Monthly testing of colonies will help keep the beekeeper aware of the overall health of a colony. Mite treatments are loosely based on time of year, but sometimes the beekeeper needs to intercede if the mite counts creep to a higher level before the normal treatment times. Mite testing is easy to do and with more experience, it will become a simple task. Keeping mite levels at the proper mite count is the key to being a successful beekeeper. New beekeepers that just started, you knew nothing of this beekeeping process at the start of the season. You started with new equipment, fed and managed your colonies. The bees thrived and at the end of the season there was a strong colony to winter. I would call that success. Cheers to the new beekeepers.